Natural Star Nani’s production venture, Awe, promises to be something different from regular movies. The trailer & first look posters looked fresh and raised many eyebrows. The film has finally hit the screens today and let’s check whether it lives up to its expectations or not. A few patchy scenes in the first half slow down the tempo of the movie. The movie runs on a complex story line which may leave a few people confused about the actual plot. This movie has a single song which comes at climax, justifying all the characters and it supports and carries the mood well. Background score by Mark is superb throughout the movie. Cinematography is fantastic and the visuals and frames the movie has are good to eye. Editing is good. Art department has a lot to do in these types of movies and they succeeded in proving their mettle. Production values are apt. Awe is an experiment Movie & It throws normal movie making out of the window. The movie runs on different genres and will clearly not go well with the B and C center audience. Concept-based films are the need of the hour in Tollywood and this film is for those who complain Tollywood does not make hate movies. 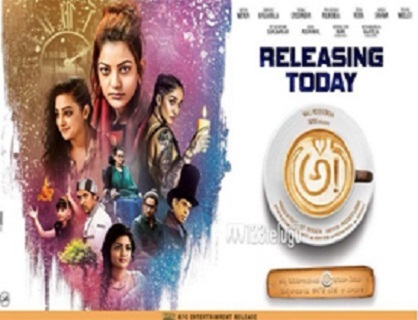 If a really different and unique film is all you want to see, Awe is the one to watch out for this weekend. Photo Story : Nikhil lost his cool, Shut up ..